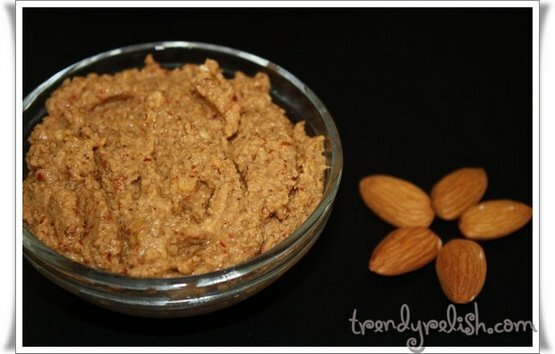 This is a delicious chutney prepared using whole almonds and tastes just like Peanut Chutney. Whenever I have these almonds at home, I prepare this yummy chutney to go with idlis or dosas. Dry roast almonds + red chilies and allow them to cool for some time. Later add these almonds + red chilies to a grinder along with coconut + cumin seeds + lemon juice + salt, pour little amount of water and grind into a smooth paste. That’s all!! Great tasting chutney is ready to be eaten with idlis or dosas or even white rice. Yummy!! you are a chutney queen Uma. Love this one. mmmm it looks simply delicious!! awesome! thanx for sharing!! Almonds instead of peanuts sounds delicious! very interesting recipe. Thanks for sharing. u r invited to participate in my blog's first ongoing event.do read the terms and participate for sure. 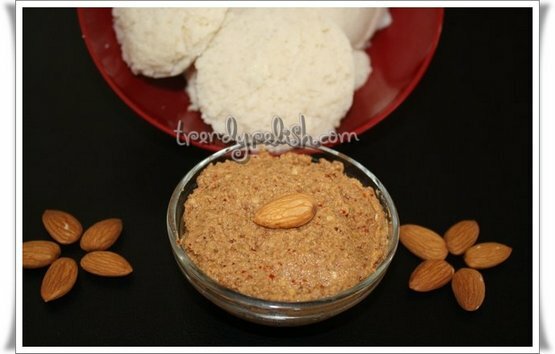 Lovely twist to ur chutney, incredible..
Almond chutney is very new to me. i must try this..